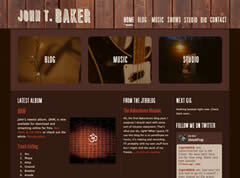 John T. Baker began recording himself in high school on a couple of cassette decks linked together. Once hooked on the concept of multitrack recording, he has not stopped experimenting with it. As a singer, songwriter and guitarist, John has spent time in a multitude of bands (The Martini Age, The French Broads, Westside Daredevils, econopop, Stolen Sheep, Ampient Music, The Elements Band, Angel & the Lovemongers, Tim Lee Band). Throughout it all, John has maintained his love of recording. While he does collaborate with a wide variety of other musicians and artists, he has approached it all with the same DIY ethos that he started with. With pop music as a starting point, Baker has created in a wide range of modalities: psychedelic, pop, ambient, folk, new wave, blues, straight ahead rock. All are styles that Baker has explored on the 10 solo records he has released since 1987. Coming in early 2011, Baker emerges with Woodgrain, a stripped down acoustic-based album of pop songs. “On the past several records, I spent a lot of energy on the weird experimental segments between songs. So for this one, I decided to strip all that away and focus just on the songs. No sleight of hand, no trickery. Just hopefully well-written songs.” The result is an organic sounding collection of understated pop gems. Look for his band econopop to be playing these songs in a music venue near you in the coming months.